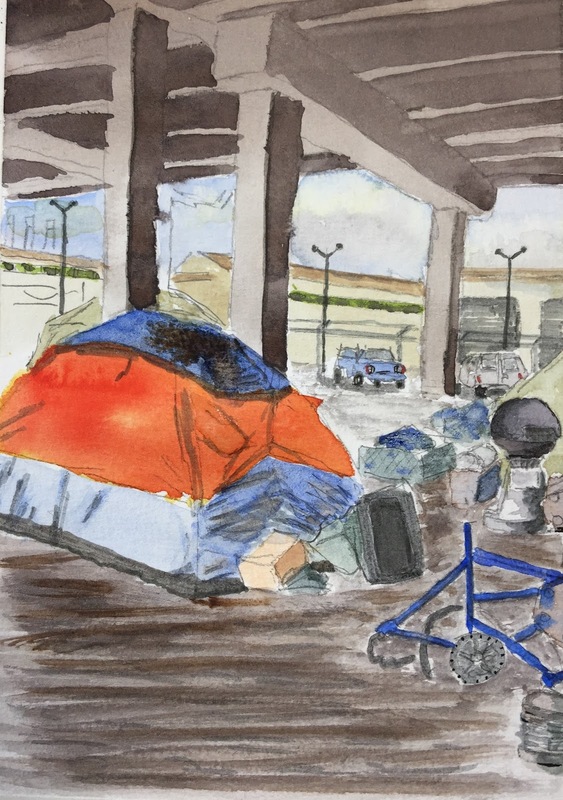 Gabi Campanario put the word out a few weeks ago that Crosscut, a local e-publication, was coordinating a media blitz homeless project to try and focus attention on the problem of homelessness in our area. They had done this last year with a fair measure of success and were hoping to build on that success again this year. Gabi had asked all of the Seattle Urban Sketchers to try and do sketches of the homeless and things associated with them and to post them with the hashtag #SeaHomeless on June 28. Tina was working with Gabi to coordinate this. Many thanks to them both for thinking of bringing us into the project and doing all the background work on our efforts! I was able to get 4 sketches done for the project. Not as many as I hoped, but hopefully this helps add to the blitz in a positive way. Here are the sketches in the order they were done. The gentleman above was living under an overpass in the SODO area of Seattle. He was the only person in this particular area. He was very reserved so we didn't talk much before he returned to his phone. He did say he was working a series of part time jobs but he was homeless because he couldn't earn enough to afford rent anywhere near, or afford to live further out and commute. I happened to pass this area again about a week later and he was gone along with his belongings. I am not sure if he found nearby housing he could afford or if he moved by choice or at the insistence of the city. 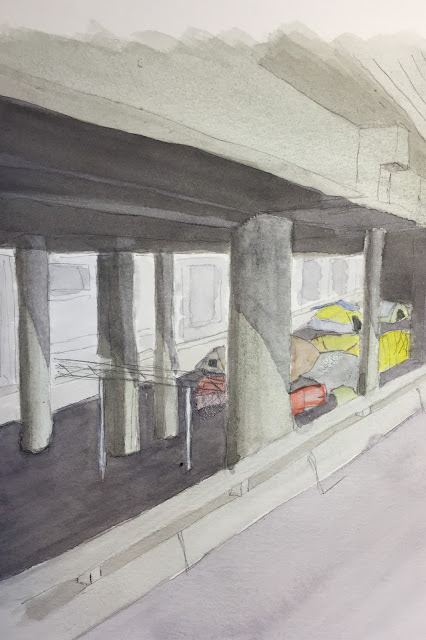 The sketch above is under the West Seattle Bridge by the 1st Ave off ramp. There are about a dozen or so tents and assorted boxes and bags and belongings scattered about under the bridge. This is a heavily used exit from the bridge for folks wanting to get to the south end of downtown, often called SODO for the South Domes, the big sports stadiums located near here. The exit is a prime area for panhandling with all the traffic coming off the bridge and the lights stopping the cars that gives the panhandlers time to be noticed by drivers. Normally I see at least a few people at this camp but not this time. I am just speculating but I would guess that these folks will be moved from under this structure at some point. In various cities bridges have been closed for significant periods of time so they could be inspected after fires started in these protected areas. RV's have caught on fire, BBQ's have flared up igniting tents and boxes and trash, etc. If nothing else traffic will be stopped while the fires are extinguished and if the fire touched the structure itself it generally gets iclosely nspected for damage. That can all take significant time. Expensive and inconvenient for people trying to use that roadway. In the case of West Seattle this bridge and exit are a prime means to go from West Seattle to downtown. Generally the City has tried to have somewhere else for people to move to, but often people don't want to move to those locations. Invariably they move back to these locations once the City is no longer watching it and the whole process starts again. This is another view of the West Seattle Bridge location in the previous sketch. In the summer it is a shaded area, and in the winter it is well sheltered from rain, and if I remember from bicycle commuting days it is also pretty sheltered from winds. It is dark though, especially in the winter. Being under and alongside major roads exposes it to a fair amount of vehicle exhaust and to lots of traffic and train noise, not to mention noise from the industrial area that surrounds it. Good and bad points as a temporary refuge for these folks. As I mentioned though, it is by a busy intersection for panhandling, as well as having good access to transit and the services homeless folks might find useful or necessary. This person was taking shelter for the night in a store front in West Seattle. The store had closed for the day and the doorway was recessed and offered some shelter from the modest rain forecast that night. The person had taken the carts that contained all their stuff and had pulled them into a little makeshift shelter or barrier. I am a bit embarrassed in that I could not tell if this person was a man or a woman. When I tried to talk with him or her the person was very shy and didn't talk, ducking down behind the carts. I gently explained what I was doing and that all they had to do was tell me no or even just wave me away. 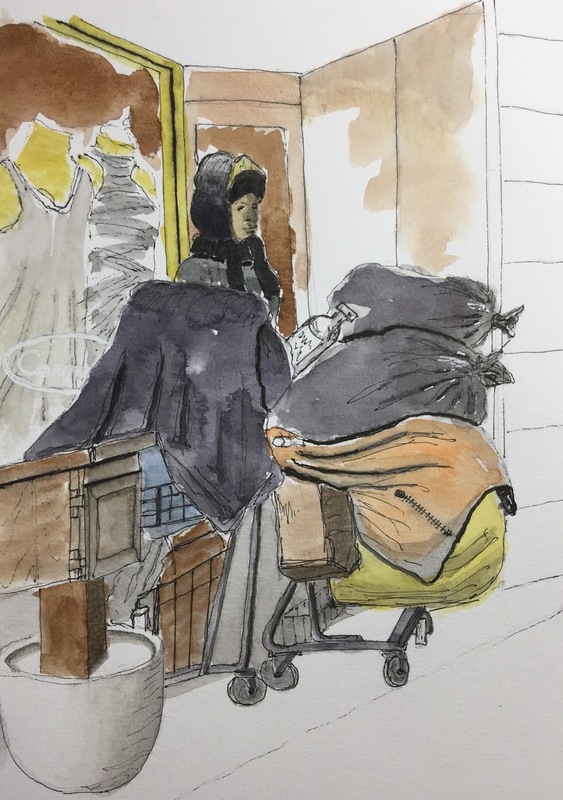 I backed up and quickly sketched the store front and carts. 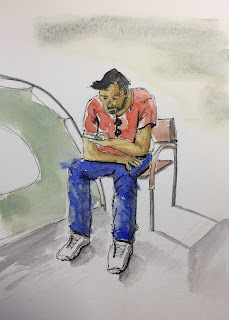 The person eventually stood and I was able to do a quick sketch but the person never talked and never looked my way. When I thanked them and asked if I could leave some cash as a thank you the person ducked down again. I took that as a no and let them be. This person was bundled up as if it were freezing out. The height of that head gear with the hood over it is not exaggerated and the jackets worn were thick and heavily layered. The night was typical for this time of year, with a forecast low of about 60, so pretty warm overall. I am an editor for a small, independent zine for the PNW underground/alternative culture. One of our contributors wrote a great poem about homelessness, and I have been struggling to find an image that would pair nicely with it. 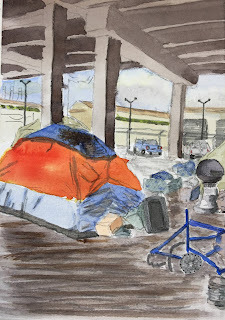 Your sketch of the the tent under the West Seattle Bridge is exactly what I was hoping for. Could we use it? Credited of course. We are a non-profit, micro publication (75 copies) that distros in King, Pierce and Kitsap counties. Admin Comment... Tina Abrams: I've emailed the author (Dave) to be sure he sees this.